The Colorado RollR 85 fully tricked out. The ROVR Products RollR cooler started the same way that many ideas do – because of a problem. Tired of carrying gear from their car to their campsite they thought there had to be a better way, and the RollR cooler was born. ROVR products has an easy to navigate website with videos explaining their products. I will be reviewing the Colorado RollR 85 in the summer heat of New Orleans and the deep south this summer. 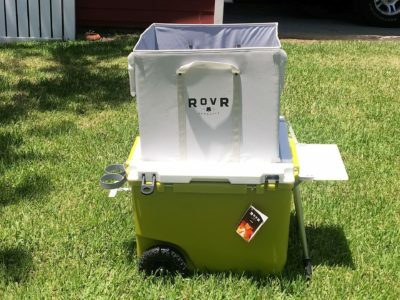 ROVR products calls it “An 85-quart carrying, all-terrain attacking, patented design that can go anywhere you can.” The RollR 85 retails for $449.